Dagmarah Mackos interviews me about my second novel, The Cambodian Book of the Dead, in last weekend’s Phnom Penh Post. Cambodia 2001 – a country re-emerges from a half century of war, genocide, famine and cultural collapse. German Detective Maier travels to Phnom Penh, the Asian kingdom’s ramshackle capital to find the heir to a Hamburg coffee empire. 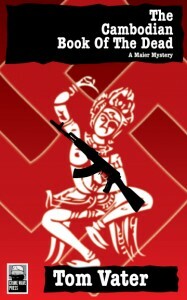 As soon as the private eye and former war reporter arrives in Cambodia, his search for the young coffee magnate leads into the darkest corners of the country’s history and back in time, through the communist revolution to the White Spider, a Nazi war criminal who hides amongst the detritus of another nation’s collapse and reigns over an ancient Khmer temple deep in the jungles of Cambodia. Maier, captured and imprisoned, is forced into the worst job of his life – he is to write the biography of the White Spider, a tale of mass murder that reaches from the Cambodian Killing Fields back to Europe’s concentration camps – or die. Crime Wave Press promotes strong voices, exceptional talent and unique points of view in the crime fiction genre.